CARFAX 1-Owner, LOW MILES - 17,186! EPA 28 MPG Hwy/18 MPG City! Nav System, Heated/Cooled Leather Seats, Onboard Communications System, Satellite Radio, WiFi Hotspot, Dual Zone A/C, Remote Engine Start, Heated Rear Seat SEE MORE! Leather Seats, Heated Driver Seat, Heated Rear Seat, Cooled Driver Seat, Satellite Radio, Onboard Communications System, Aluminum Wheels, Remote Engine Start, Dual Zone A/C, WiFi Hotspot, HID headlights, Heated Seats, Heated Leather Seats, Heated/Cooled Seats Keyless Entry, Remote Trunk Release, Child Safety Locks, Steering Wheel Controls, Electronic Stability Control. DRIVER AWARENESS PACKAGE includes (UHX) Lane Keep Assist, (UFT) Side Blind Zone Alert, (UFG) Rear Cross-Traffic Alert, (UEU) Forward Collision Alert, (UVH) Surround Vision and Safety Alert Seat, CADILLAC CUE INFORMATION AND MEDIA CONTROL SYSTEM WITH EMBEDDED NAVIGATION AM/FM stereo with embedded navigation, 8" diagonal color information display, USB ports, auxiliary input jack, Natural Voice Recognition and Phone Integration for Apple CarPlay capability for compatible phone (Includes (UQA) Bose premium 8-speaker system.) (STD), TRANSMISSION, 6-SPEED AUTOMATIC electronically controlled, FWD (STD), ENGINE, 3.6L SIDI DOHC V6 VVT (304 hp [226 kW] @ 6800 rpm, 264 lb-ft of torque [355 N-m] @ 5300 rpm) (STD). Cadillac Luxury Collection with Red Passion Tintcoat exterior and Shale with Cocoa accents interior features a V6 Cylinder Engine with 304 HP at 6800 RPM*. Blind Spot Monitor Great Gas Mileage: 28 MPG Hwy. Edmunds.com explains "As imposing as the 2016 Cadillac XTS seems at the curb, it's a distinctly smaller car from behind the wheel. 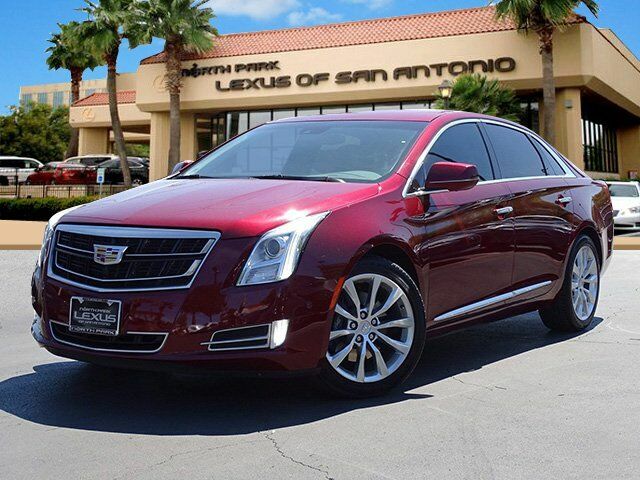 Thanks to the standard adaptive suspension and trusty steering, the XTS manages to shrink its big body around the driver. ".